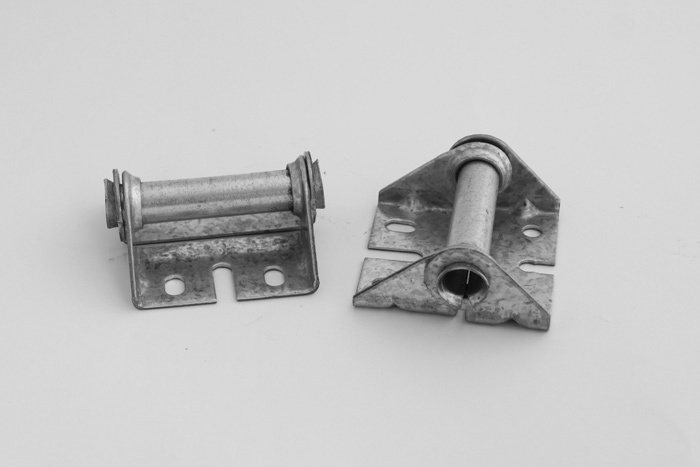 Hinges come in different formats, sizes and thicknesses (gauge) based on the dimensions of the garage door and if it is equipped with windows or with all-windowed panoramic sections. Hinges are normally identified (stamped) with numbers from 1 to 10, indicating their installation location on the garage door. Are there different qualities for hinges? Hinge quality is measured by the thickness of the steel used. This is measured in gauge: the lower the number, the thicker the steel. Ask for hinges with a thickness of at least 14 gauge for your residential door. Can I extend the life of my hinges? YES, by lubricating the moving parts twice a year. See our maintenance guide. Can I change a broken hinge by myself? Yes, if it happens to be a hinge located in the middle of the door. Make sure that your electric garage door opener is deactivated (unplugged from the electrical outlet) so that no one can open the door with a remote control during your repair work. However, we strongly recommend you contact us as soon as possible if you discover that another hinge is broken or on the verge of falling off. Immediately block access to the door to ensure that no one can use it. Then, let us do that repair work instead of undertaking it yourself. We provide prompt repair service because we keep necessary replacement parts in our warehouse. In addition, we guarantee both our work and the parts that are changed. We also use our visit to adjust other components that could fail. If we see that there are other parts that need changing, we will notify you before doing any work and provide you with the approximate replacement cost.